Klang Drum Machine by Super Synths is a Virtual Instrument Audio Plugin. It functions as a VST Plugin. 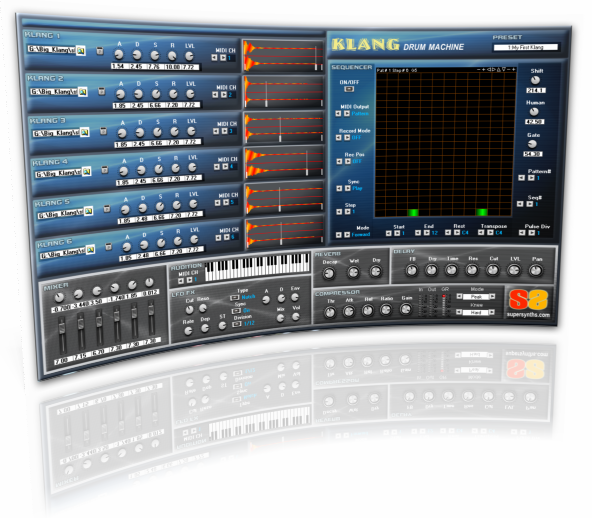 Klang Drum Machine is a full-featured drum machine that can load and play wave files and comes with a large selection of drum samples from our Klang core library. It has 8 layers, each with its own mixer, panner, MIDI channel selector, envelope controls and loop editor. 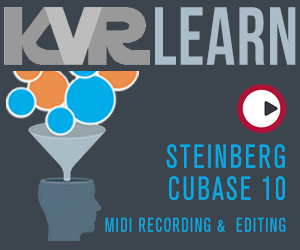 Each layer is MIDI CC learnable, so you can assign them to pads, keys, etc. The pattern sequencer allows you to either create up to 64 patterns that can play in any order you wish or you can stack them to create multi-timbral patterns. A series of video demos are in the works to show how you use every facet of the pattern sequencer and loop editors, as well as everything else. Finally, you can load and save patterns and banks of patterns. Klang drum machine also has great effects - reverb, delay and a complete compressor - all tempo synced for great tempo effects. Klang also comes with a simple unison drone oscillator - create rumbling drones or scifi sounds - skies the limit - and with up to 8 voice unison - the thing can get BIG and JUICY. Included is the Klang core library (326MB compressed) - 750MB uncompressed of klangs, hits, strikes, stingers and more. We went to various locations and hit, struck and literally beat the CRAP out of all kinds of metallic containers, barrels, dumpsters, ethnic drums, industrial machinery, stairwells, metal banisters and anything else made out of metal, steel and brass. Also included are tons of new dry samples of bass drums, snares, toms, cymbals, side sticks and more - sampled from a gorgeous 12-piece Tama acoustic drum set and extra typical and rare cymbals, crashes, rides, gongs, etc. - plenty of bread and butter samples to allow you to create any kind of percussion tracks you wish.